Outback oasis, Birdsville Hotel, Queensland (photo: Steve Madgwick). ‘Hard yard’ hats – Birdsville Hotel, outback Queensland (photo: Steve Madgwick). Don’t just stop outside and snap the obligatory photo of one of the most photogenic outback pubs in Australia (circa 1884) – although you won’t be able to help yourself. 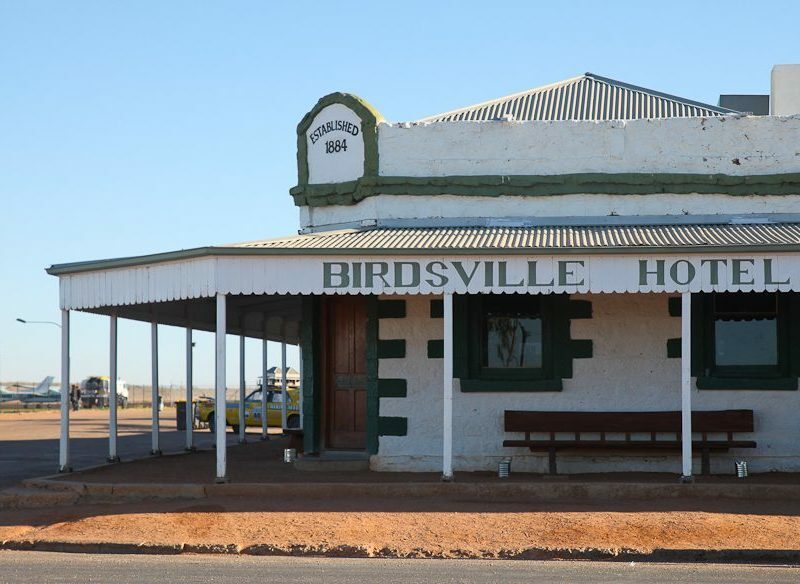 Step inside the Birdsville Hotel, reward yourself with a cold beverage and a bite to eat and marvel at the memorabilia. Start by counting the hats stuck to the ceiling of the public bar, each one representing someone who has done the “hard yards” in Birdsville (representing those who have spent more than a year here). The food and accommodation are as good as anywhere you’ll get for miles and miles and miles around. The ‘C’ means it’s a camel pie, Birdsville Bakery (photo: Steve Madgwick). For the adventurous gastronomist, wander across the oval to Birdsville Bakery to sample the town’s culinary gift to the world: the camel pie. Marked with a big ‘C’ on top of the crust, the $6 pastry has a curry zing and a lamb-like texture, the tender minced meat is not lumpy or humpy. If camel’s a trek too far for you, try the kangaroo and claret pie or the berri quandong tart. It’s also extra special because Birdsville’s is one of only a handful of licensed bakeries in Australia. The (licensed) Birdsville Bakery, outback Queensland. The 40-metre high Big Red dune, gateway to the Simpson Desert (and 4WDers funpark). (Photo: Steve Madgwick). Thirty-five kilometres west of the town, along an unsealed but passable road (as long as it’s dry), the trademark ochre dunes of the Simpson Desert begin. Closest to Birdsville are Little Red and Big Red (40 metres high), which are the gateway to the Simpson traverse for hard-core 4WDers. Please note that Big Red is on private land so show respect accordingly. At sunset and sunrise, you’ll get to see why Simpson is truly a redhead. The Big Red Run seems like a crazy idea – a 250-kilometre foot race through the Simpson Desert – but funds raised from the event go towards great causes (including childhood diabetes), and all the athletes are consenting adults. Ultra-marathoners from all around compete in the equivalent of 5 marathons in 6 days. Directly after the run, the now annual Big Red Bash, a two-day concert featuring Australian rock royalty, is held on a makeshift stage constructed at the bottom of Big Red, creating a huge desert amphitheatre. It’s fast becoming a pilgrimage that one day may challenge the races for sheer numbers making the trip. While there are no major art spots in the area, there are some sites of significance for traditional custodians of the area, the Wangkangurru-Yarluyandi people. A tour can be arrange to the Two Boys Dreaming site from the Wirrarri Information Centre (you can’t miss it). While you’re at Wirrarri, browse the attached gallery for some amazing desert-scape photography and local art. The pub is only one of the ways to cool down in town. A nice stroll past the bakery will take you to Birdsville Billabong – great for a dip, a yabby hunt or for birdwatchers. For a more adventurous style of outback swim, ask the locals if any of the surrounding (seasonal) waterholes are ripe for a dip. Make sure you get permission first, because many are on private land. 7. Waddi type of trees are they? Head north out of town (14 kilometres towards Bedourie) and you will happen upon the fish-out-of-water rare desert waddi trees (seeds from these trees were discovered in Wills’ diary). Some of the trees are said to a 1000 years old and their wood is abnormally hard. The best vantage point to see the waddis is atop the mysteriously named Dingo Caves (note, there are no actual dingoes in the caves). There are plenty of legendary outback landmarks close (in a bush context) to Birdsville but just far enough out of town to make them too challenging for first-time 4WD-ers short of recovery and bush skills (or for those flying in). Local company Deserts Edge Tours operates organised and bespoke excursions to places such as Cameron Corner (where Queensland, South Australia and New South Wales meet) or Poeppel Corner (where Queensland, South Australia and the Northern Territory meet) in its huge, dune-munching 4WD-bus hybrid. For an aerial perspective of Channel Country, Central Eagle Aviation offer charters and joy flights such as 30-minutes over Big Red. Many towns around Australia’s centre have a Burke and Wills encounter story, as does Birdsville. Evidence of the ludicrously intrepid pair’s connection to the area stands about three kilometres south of the centre where one of them is said to have slashed a tree, which still stands today. It’s a subtle but worthy notch on your outback belt. For those who fly (instead of drive) from Birdsville back to Brisbane you won’t get that slow-burn iconic outback trip moment, but you’ll have your own unique experience to talk about. The Milk Run, the REX flight back to Brisbane, touches down at a handful of outback towns you’ve probably never been to before, including Windorah, Quilpie and Charleville. The steward has to repeat the safety talk every time you take-off despite the fact the passengers are basically the same. Expect a complimentary beverage and biscuit on every leg too.